There are many benefits to aerobic exercise. The benefits include weight-loss, improving endurance, strengthening the heart and even increasing your lung capacity. High-intensity continuous cardio exercise is most often used to increase lung capacity and to clean the lungs, according to a study published in the "Annals of Internal Medicine". However, the study notes that continuous running can be difficult for people who experience shortness of breath or have a respiratory illness such as COPD, or Chronic Obstructive Pulmonary Disease. Shorter durations of intense interval running are easier to perform and can help increase lung capacity. Select an outdoor location with plenty of trees and limited traffic to reduce your exposure to air pollutants from cars while you are running to clean your lungs. 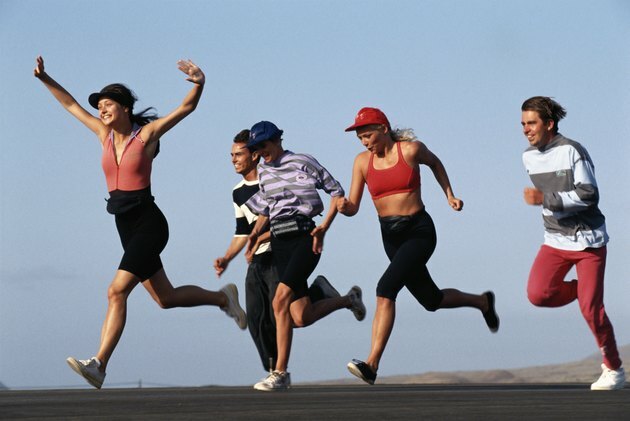 Start your running in the early hours or late hours of the day to avoid high traffic times. Use a stopwatch to time your intervals. Begin jogging for the first 30 seconds. Run as fast as you can at a comfortable pace for the second 30 seconds. Breathe in at every two or three steps you take and exhale for every 2 to 3 steps to establish a good breathing pattern during your run. Stop if you feel any nausea, tightness in your chest or any other discomforts. Carry a water bottle so that you get plenty of water during your exercise. Repeat your running intervals three times a week. Increase the running time by one minute on the third day of your exercise each week so that by the end of week one you are doing running intervals for 8 minutes. Increase running time to 10 minutes by the end of the fourth week, and after 3 months your endurance and lung capacity should increase enough to do 20 minutes of interval running. You should consult a physician before beginning an exercise routine if you have an illness such as lung or heart disease.